I’ve been playing with the TLC5940 for a few years now. I aim to eventually have it play a part in a larger project but I need to get a few things ironed out first. 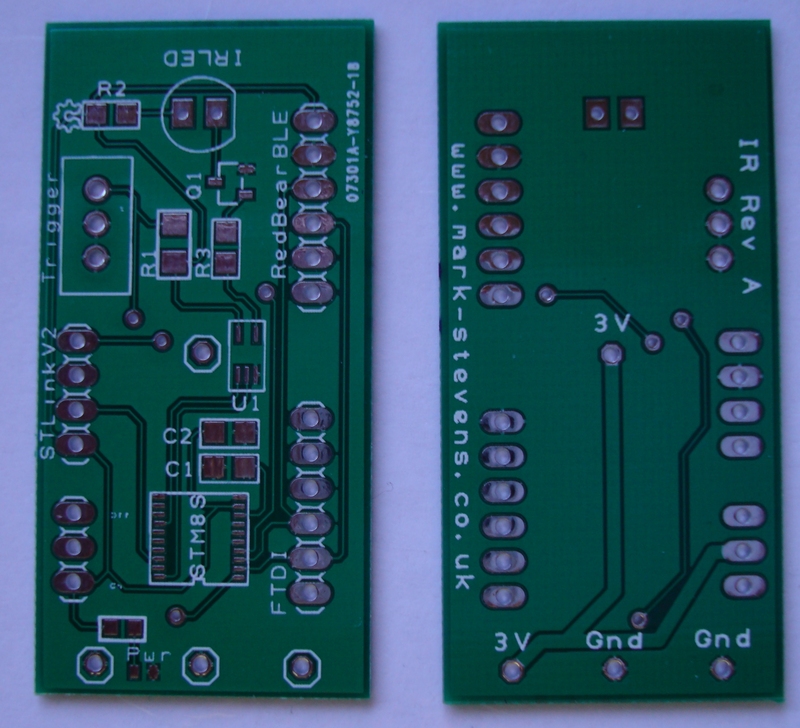 I’m currently on my second prototype board, well they are more proof of concept boards really. This post is not really about the boards themselves but more about the mistakes I’ve made along the way. Hence the title of this post, Why do we prototype? I think the simple answer is that we make mistakes. 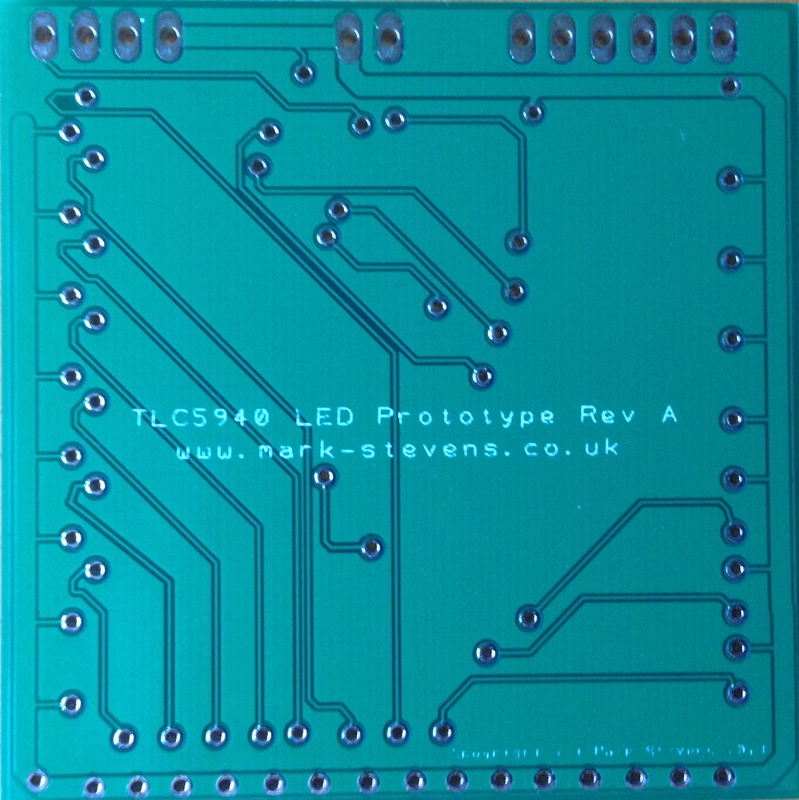 The long term aim of this project is to use the TLC5940 to drive a grid of LEDs. The chip allows the connection of the LEDs directly to the chip but I want to use a transistor (or an equivalent) to turn the LEDs on and off and not the TLC5940 directly. The breadboard circuit had all of the necessary components on the board and was pretty simple to get going. 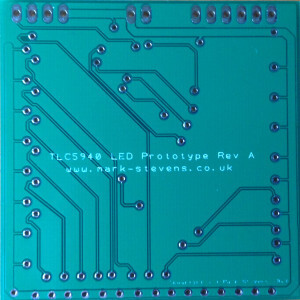 I started by connecting the LEDs directly to the TLC5940 and then built the software to run the circuit. The software runs on the STM8S103F3. The next step is to connect one or more LEDs through a transistor. For this I used a PNP transistor and connected one of the LEDs using the transistor as a switch. So far, so good. All is well with the world and I have some flashing LEDs. 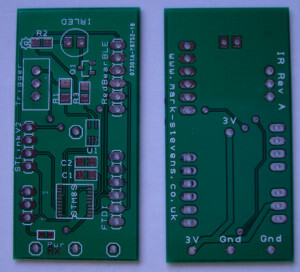 At this point I had designed a few boards and thought I’d push my SMD skills a little. 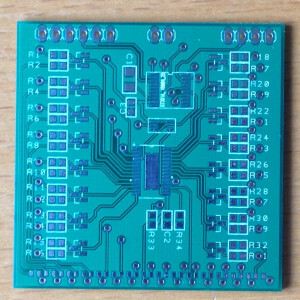 I decided to use iTeads 5cm x 5cm manufacturing service and with the exception of the external connectors I would use SMD components only. To give you an idea of the scale of this, the circuit requires 2 ICs plus 6 supporting discrete components. Each LED (and there are 16 of them) requires three discrete components for the driver plus the LED itself. This did not really cause an issue as there was no routing error but I could have routed these tracks more elegantly. The problem was caused by me having both the top and bottom traces visible at the same time. In my mind I had to route these tracks around the traces on the top layer as well as the artefacts on the bottom layer. Hence I took the traces around the via when I could have taken them directly from the via on the right (as viewed from below). I would have spotted this more logical routing had I turned off the top copper view as soon as the trace passed through to the bottom copper layer. Not really an error, more of a cosmetic nicety. 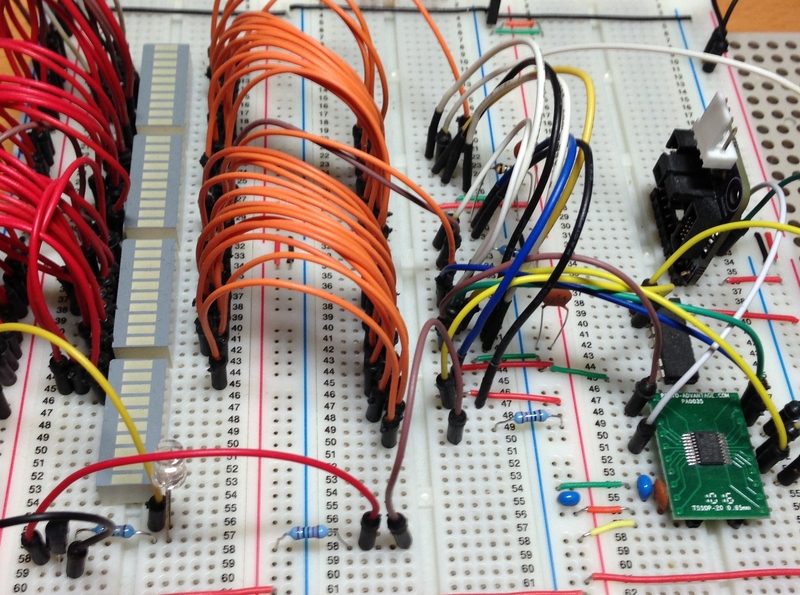 I did not get an equivalent PTH part and test it on the breadboard first. As it stands the transistor driver circuit does not function and needs some more attention. To enable testing of the remainder of the circuit you can use the following work around. Abandon the driver and change the value of the IREF resistor to allow a small enough current through the LED. Some of the parts I used in the design are 0402. These are small parts and really difficult to solder. It is especially difficult to see markings on the components. In future I think 0603 is as small as I’ll go. The Rev A board was a bit of a disaster. 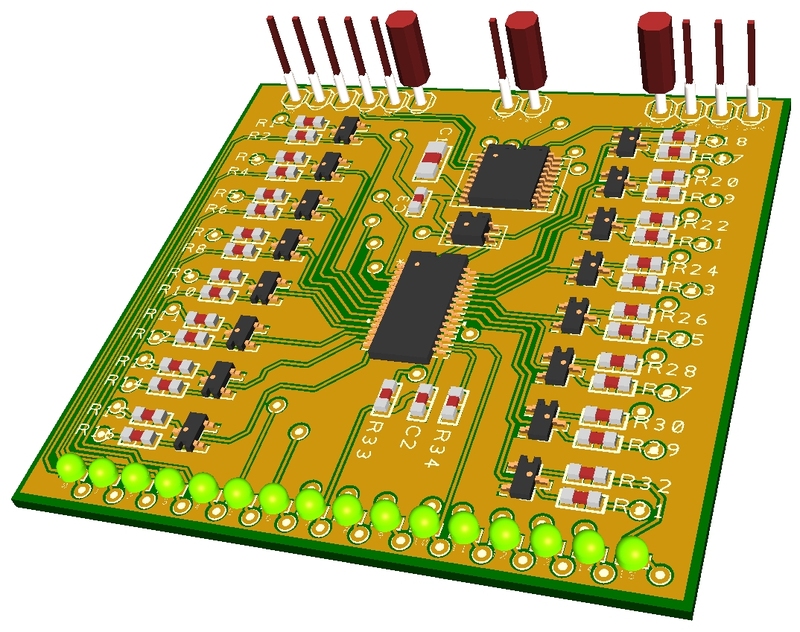 I never really managed to get the board working so it was time to go back to first principles and build a simpler board. Enter Revision B. Revision B of the board will have a reduced brief. 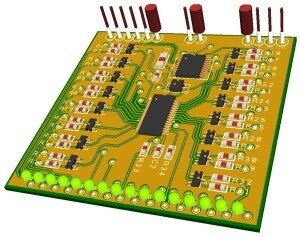 This board will use a mixture of SMD and PTH components. 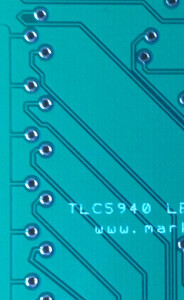 The STM8S and supporting components will be surface mount but the TLC5940’s will be PTH. I’m getting reasonably confident that I can get the STM8S on a board and working even in surface mount format. In redesigning the circuit I had to replace the TLC5940 component and so added the new one and changed the resistor value for the LEDs I’d be working with. Except I connected the IREF resistor to Vcc instead of ground. 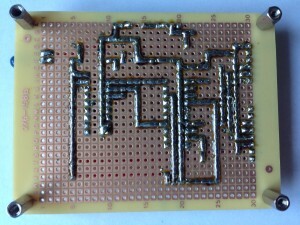 For this circuit I use a single AND gate to square off the CCO output from the STM8S. 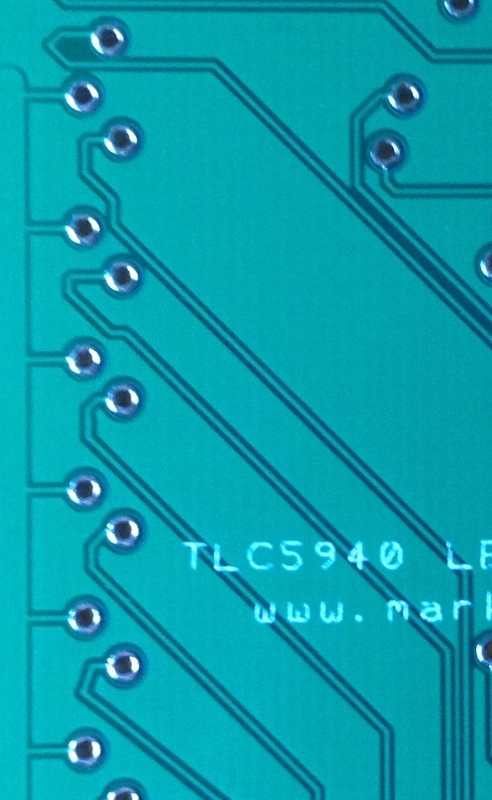 This small IC was placed onto the board after the connector for the ST-Link programmer. The only problem was that I was using a hot air rework station to fix this part to the board. The hot air from the rework station caused some bubbling on the plastic of the connector. I suppose this brings me to the next lesson. OK, so there’s been too much Star Wars on TV over Christmas. What I really mean is, when prototyping, use all of the board available to you. 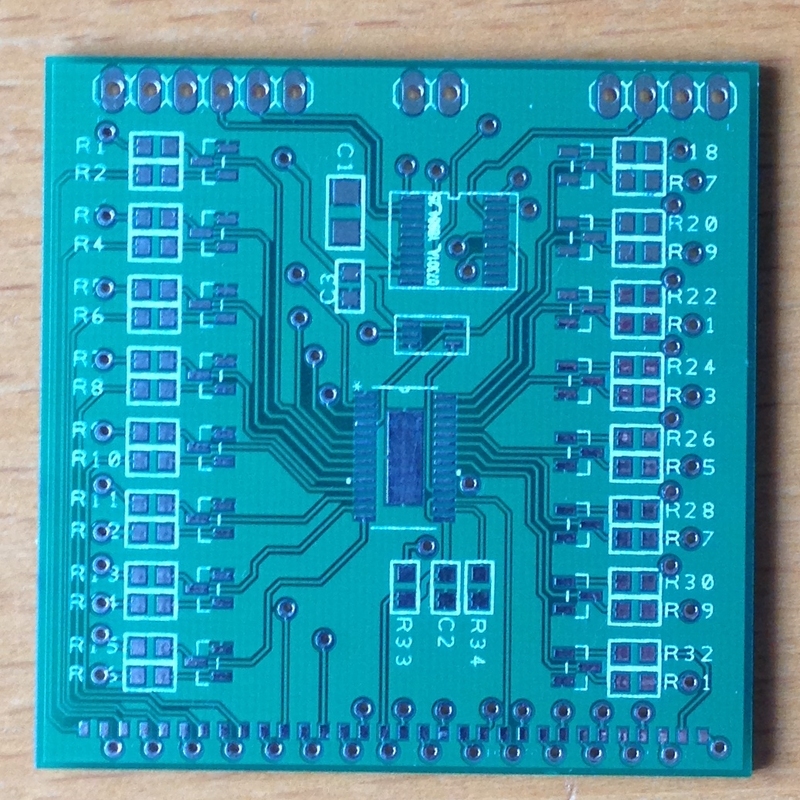 The manufacturing process I used allowed for a 10cm x 5cm board (or anything up to that size) for a fixed price. For this board there is a lot of spare real estate and I could, with ease, have put that connector and the IC where they would not have interfered with each other. The final board may have to be compact and fit into a location determined by the rest of the project but when testing you might as well use all of the space to your advantage. I have a working Revision B board which mean I can free up the breadboard for other work but there is still some way to go before I have the final project completed. As with all things in life, this is a learning experience. Posted in Electronics, STM8 | Comments Off on Why Do We Prototype? Now that we have the major components of the Nikon D70 Remote Control unit in place it is about time the unit moved from breadboard to a more permanent home. The last day or two has seen the unit move from breadboard to protoboard. The eagle eyed amongst you may have noticed that I used a 16-pin DIP socket for the AND gates when I should really have used a 14-pin socket. A little solder soon fixed that problem. The connectors on the right hand side of the board provide the serial connections by FTDI (upper male connector) and RedBear BLE Mini (lower female connector). 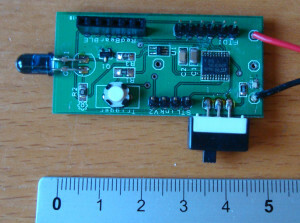 The connection at the bottom of the board is the STLink/V2 connector. Building the board was not too difficult. The code for the STM8S needed a small modification to move the application from the STM8S105 on the Discovery board to the STM8S103F3 which I have on the DIP to protoboard converter. If all goes well it may even end up with a PCB being manufactured and a 3D printed case being made. Forgot to mention, it still triggers the camera. A remote control which can only generate a signal when initially powered up is of limited use. The addition of a switch will allow the user to determine when the camera is triggered. The initial versions of the infra-red remote control for the Nikon D70 which have been discussed so far are limited in that the control sequence is transmitted when the STM8S starts and never again until the next time the STM8S is restarted/reset. Adding a button to the remote control will allow the user to select when the control sequence is transmitted. One of the main problems with switches is that they are subject to switch bounce. You can see an example of this in the post regarding External Interrupts on the STM8S. There are two approaches to switch debouncing, software and hardware. The button on the infra-red remote control will be triggering a sequence of pulses which will typically last several milliseconds. This means that it lends itself to software debouncing using a simple state machine. The state machine will put the infra-red remote control into two states, waiting for user input and running. When waiting for user input the interrupt handler for the switch will accept user input. When in the running mode the system will be generating the infra-red output for the camera and it will ignore any input from the switch. At the end of the infra-red sequence the switch input will be re-enabled. //  Now set up the ports. //  PD3 - IR Pulse signal. //  PD4 - Input pin indicating that the user wishes to trigger the camera. //  PD3 is the output for the IR control. //  Now configure the input pin. PD_DDR_DDR4 = 0;        //  PD4 is input. PD_CR1_C14 = 1;         //  PD4 is floating input. //  Set up the interrupt. EXTI_CR1_PDIS = 1;      //  Interrupt on rising edge. EXTI_CR2_TLIS = 1;      //  Rising edge only. The modifications to the SetupPorts method keeps the infra-red output on PD3 but adds an input on PD4 with a rising edge interrupt. //  Process the interrupt generated by the pressing of the button. //  This ISR makes the assumption that we only have on incoming interrupt on Port D.
//  Set everything up ready for the timers. //  reload and enable Timers 1 & 2. The exact code required for setting up the timer will be revealed following the EEPROM section of this post. In the post Storing Data in the EEPROM on the STM8S we saw how we could save data into the EEPROM of the STM8S for later retrieval. The data used in the example should look familiar if you have been following this series on the Nikon D70 Remote Control as it is the timing and signal data which triggers the Nikon D70. Create a new project for the above and execute the program on the STM8S Discovery board. This should set up the timing data ready for use to use. //  Define where we will be working in the EEPROM. //  Data ready for the pulse timer ISR's to use. TIM1_CR1_CEN = 0;           //  Stop Timer 1. TIM2_SR1_UIF = 0;               //  Reset the interrupt otherwise it will fire again straight away. The addition of the button certainly makes the remote control more usable as the user can elect when to trigger the camera. At this stage, the EEPROM does not offer too many advantages over the use of the static data but it can allow the remote control to be fine-tuned at a later stage. The acid test, does it still trigger the camera – Yes it does. A quiet Sunday here in the North of England so I decided to add the 38.4KHz modulation to the Nikon D70 Infra-red Remote Control. The software implementation is attractive as it does not require the addition of any additional components to the circuit and hence reduces the cost of the remote control. On the downside, this requires a slightly more complex implementation and may cause some issues due to the timing of the interrupts. Using PWM is a much simpler software solution as it only requires that the timers are setup correctly and turned on at the right time. In the final image above, the top trace shows the clock signal, the middle trace shows the digital signal we wish to generate and the lower trace shows the signal which should be output by the circuit. The hardware solution requires the combination of a digital signal with a PWM signal. The easiest way to do this is to use a single AND gate taking input from the digital output required and a clock signal. Searching the RS Components web site lead to a single and gate component for a small price. This would be ideal for solving this problem. The software changes are minimal as we simply need to configure a timer and turning it on and off as required. We will be using Timer 1, Channel 4 configured to generate a 38.4KHz PWM signal. //  Set up Timer 1, channel 4 to output a single pulse lasting 240 uS. TIM1_CCR4H = 0x00;      //  26 = 50% duty cycle (based on TIM1_ARR). TIM1_BKR_MOE = 1;       //  Enable the main output. //  reload and enable Timer 2. As you can see, the modulated output is composed of a series of 38.4KHz clock pulses which are only generated when the digital signal should be high (logic 1). The remainder of the time the trace shows no output. The final test is to see if this will trigger the camera, and yes, it still does. A few weeks ago I started to investigate infra-red transmitters with the intention of looking at implementing a remote control for my DSLR. 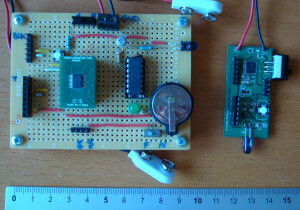 The first post established the fundamentals by creating a low power transmitter and a receiver. 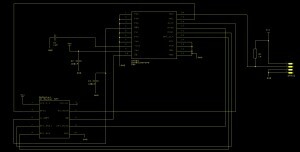 This post takes this one step further and attempts to trigger the Nikon D70 DSLR under the control of a microcontroller. The Nikon D70 uses the ML-L3 infra-red remote control to trigger the camera. I chose this experiment as a first step to a more advanced remote control for my camera. The experiment builds upon the previous work with the STM8S and infra-red signals to trigger the DSLR. The remote sequence required to trigger the Nikon D70 has been investigated before. I found the post by Michelle Bighignoli to be the most helpful for this particular exercise. The pulse is also modulated at a frequency of 38.4KHz. All that needs to be done is to put this together on breadboard and setup the STM8S ready for programming. The initial version of the software will simply emit the infra-red pulse sequence as soon as it powers up as I am only looking at a proof of concept at this stage. We will not consider the topic of modulation at this stage. Looking at the pulse sequence, the application will need to be able to generate infra-red pulses with control down to the micro-second level. The pulse widths are reasonably large, the smallest is 400uS. Taking this into consideration, the default clock speed of 2MHz will be used for the initial version of the application. The most obvious way of controlling the pulse widths is to use one of the built in system timers. The most obvious choice is to use Timer 2 as we are going to be using the default clock speed and only require an accuracy of a micro-second or so. This will give a count in the range 0-65535 implying that the maximum pulse width will be 65,535uS assuming we use a prescalar of 2 to divide down the clock frequency used by Timer 2 to 1MHz. The timers use two eight bit values to control the counting. This will require that the 16-bit values we have for the pulse durations will need to be broken down into two parts either before the sequence starts or as the sequence is being generated (i.e. in the timer Interrupt Service Routine (ISR)). The method chosen here is to perform this operation before the first pulse is generated. This will allow for a quicker ISR. Design decisions over, let’s start to look at the code. The data for the timers will be broken down into the high and low byte values for the pulse duration. Along with this we will need to store the pulse type, namely high or low. This makes the pulse sequence more readable for the programmer. This data needs to be stored as a sequence of 8-bit values representing the high and low bytes of the pulse durations to speed up the ISR. //  Prepare the data for the timer ISRs. Now we have a method of converting the pulses into a format ready for the Timer and the ISR we need to setup the Timer and implement the ISR. The ISR is relatively simple, we need to work out if there is any more pulse data to process. If there is then we load the new data into the counter, set the pulse output and exit the ISR. If there is no more data then we simply set the pulse output and disable the timer. //  Now set up the output ports. //  PD4 is the output for the IR control. Examination of the timings of the pulses reveals that the pulse widths match those in the original specification above. 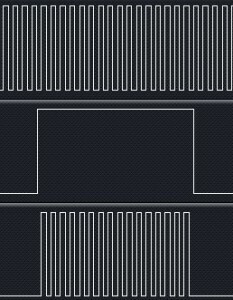 The small spike at the start of the pulse sequence only appears when the circuit is first turned on. At the moment we are only generating the raw pulses, we have not started to modulate the signal using the 38.4KHz carrier. This is left for a future experiment or indeed as a exercise for the reader. One thing I could not resist was trying this with the Nikon camera, even though the specification stated that a 38.4KHz carrier was required. Running the code with the camera set to manual mode resulted in the camera being triggered. 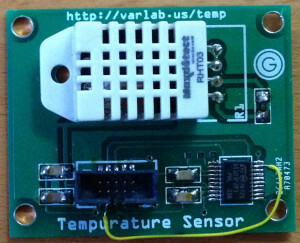 Temperature and Humidity Sensor Module for the Netduino GO! A while ago (forgive the pun), Arron Chapman and I started to collaborate on building a temperature and humidity sensor based upon the DHT22 sensor. One of the original posts discussing the module can be found here in the Netduino forums. From the very start we agreed that both the hardware and software would be open source. 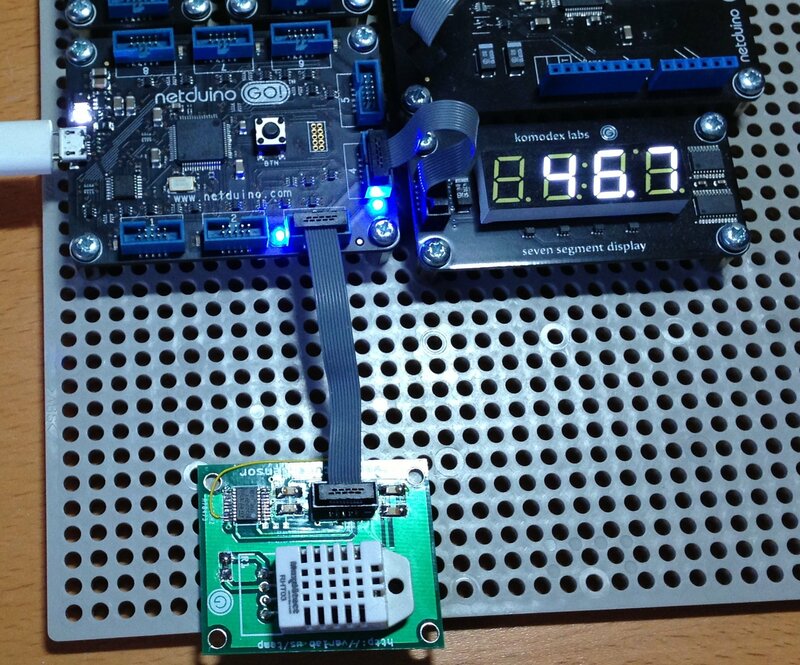 This post will discuss the basic hardware requirements and the software required to create a Temperature and Humidity Module for the Netduino GO!. The design work for this module is the combined effort of Arron Chapman of Variable Labs and myself. The DHT22 is a four pin package capable of measuring temperature (+/- 0.5C) and humidity (+/- 5%). The package uses a single wire interface for communication and can be powered by 3.3-5V. The single wire protocol used is not compatible with Dallas single wire protocol. Pin 2 (Data/Signal) should be connected to the microcontroller with a pull-up resistor to VDD. The communication starts with the microcontroller sending the start signal. 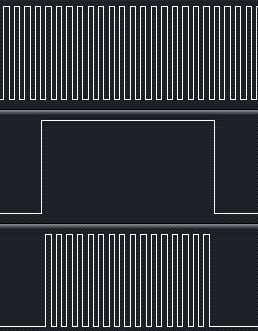 The microcontroller pulls the signal line low for at least 1-10ms. 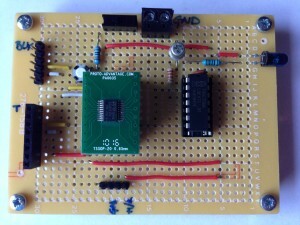 This ensures that the sensor can detect the microcontrollers signal. The microcontroller then pulls up the signal line and then waits for 20-40us for the sensor to respond. As you can see, in this case the signal line was pulled low by the microcontroller for about 6.25mS. The sensor then pulls the signal line low for 80us followed by pulling up the signal line for a further 80us. 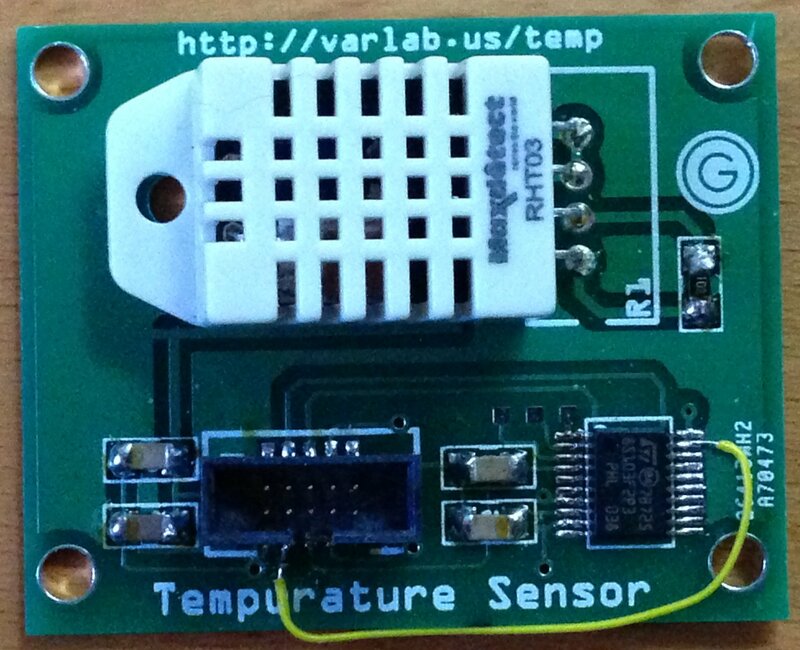 At this point the sensor is ready to start to transmit the temperature and humidity data. The data is transmitted by varying the length of time the signal pin is held high. Transmission of a single bit starts by pulling the signal line low. A 0 bit is indicated by the sensor pulling the signal line high for 26-28us. pulling the signal high for 70us indicates a 1. Both the temperature and the humidity are represented as an integer. The actual value is obtained by converting the binary number to decimal and then dividing by 10. If the high bit of the temperature reading is 1 then the value represents a negative temperature. The final 8 bits of the data packet contain the checksum. The checksum is the result of adding the four bytes of the temperature and humidity data. Aside from the components required to make a basic module, the board really only required two parts, a single pull-up resistor and the DHT22 Temperature and Humidity sensor itself. 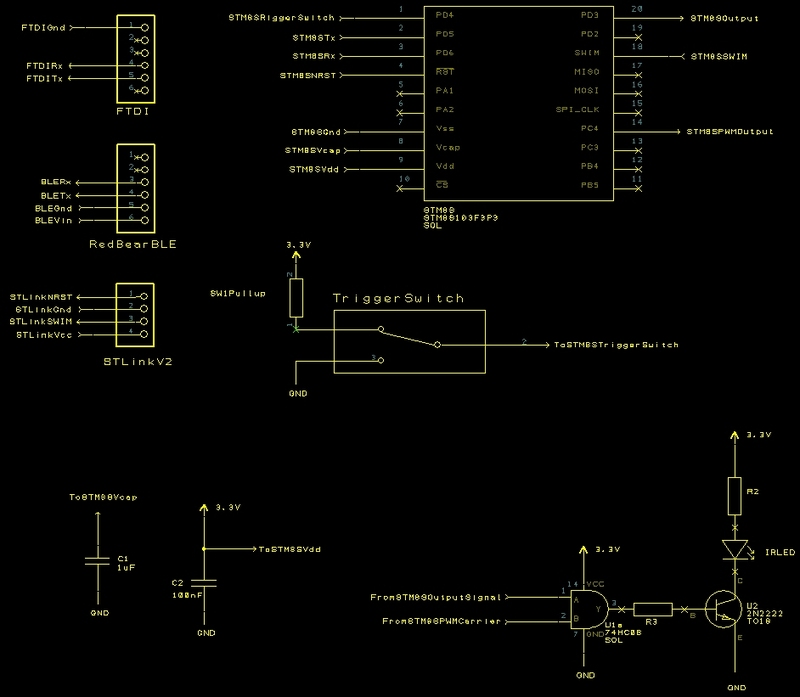 The components to the left of the diagram should be familiar if you have read the previous posts on making a module. 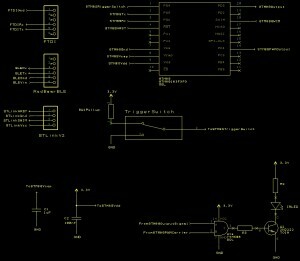 The only additional parts can be seen to the right of the schematic. One of the tests I do on any PCBs I have made is a connectivity test. I do this when the board is unpopulated and simply walk through the list of connections and verify that there are no problems. I also take the software I have written during prototyping on the breadboard and check that the pins on the STM8S are connected to the correct points on the PCB. It was during this test that I found that a connection had been missed off of the original schematic, namely the connection from the GO! connector and the GPIO pin which is used to signal that data is ready for the GO! to consume. A quick fix once the board had been populated. Notice the yellow wire – this goes to show the value of prototyping even for the smallest and seemingly simplest of projects. The state machine relies upon the timers to change the state based upon the minimum values for the time periods set by the sensor. For the start signal, the signal line is set low and the timer started. When the timer interrupt is triggered, the timer is turned off and reset. The signal pin is then switched from being an output pin to input with interrupts enabled. The timer is then restarted with a time period slightly larger than that required to ready all 40 bits of data from the sensor. In the final stage, the interrupts are turned off, the data is processed and the system put to sleep (from a reading point of view) for more than 2 seconds. In read mode, the system merely waits for interrupts to be generated by the sensor changing the state of the signal line. When an interrupt occurs, the time stamp (from the currently running timer) is read and recorded. The duration of the signal can then be calculated later (in stage three, pause mode) and the bit stream reconstructed from the timings. From a high level, the temperature and humidity module should provide the ability to read the current temperature and humidity (given the restrictions on the sensors delay of 2 seconds between readings). In addition, it would be desirable to allow the system to generate alarms for readings which are out of range. As with all Netduino GO! 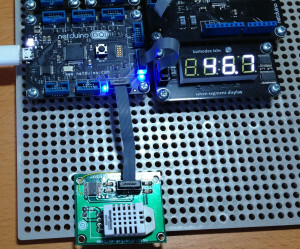 modules, this functionality is split between the module and the module driver running on the Netduino GO!. The code on the module takes care of all the communication with the sensor. It takes this information and then responds to requests from the module driver on the Netdunio GO!. The software on the STM8S started life as the basic STM8S module software which has been used in previous posts. //  Setup Timer 2 to pause for 3.2 seconds following power up. //          for this sensor. This means we have milliseconds for this ISR. TIM2_EGR_UG = 1;        //  Force counter update. //  want to start to read data from the sensor. PIN_DHT22_DIRECTION = 0;//  DHT22 pin is input. PIN_DHT22_MODE = 0;     //  DHT22 pin is floating input. //  for us to process it. TIM2_ARRH = 0x13;       //  High byte of 5,000. TIM2_ARRL = 0x88;       //  Low byte of 5,000. //  before reading the next value. PIN_DHT22_DATA = 1;     //  Set the output high after the data has been read. PIN_DHT22_DIRECTION = 1;//  DHT22 data pin is output. //  of 11 should result in a ~4 seconds delay). TIM2_CR1_CEN = 1;               //  Re-enable Timer 2. Much of the code in the Interrupt Service Routine (ISR) above is concerned with recording the current state and resetting the timer ready to move into the next state. A key point to notice here is the change of use for the GPIO pin connected to the sensor. When the ISR is entered and we are in pause mode (case MODE_PAUSE), we reset the timer and drop the signal line connected to the DHT22 (PIN_DHT22_DATA = 0). We then enter the next mode, MODE_SENDING_START_SIGNAL. The next time the ISR is entered we should have just completed the time needed to keep the signal line low and for the sensor to be ready to send the data on the signal line. So we pull the signal line high and then change the direction of the GPIO line and the line becomes an input line which generates and interrupt. We then record the fact that we have changed to the next mode (MODE_READING_DATA), reset the timers and start to wait again. In the final state, we should have received a full data packet from the sensor so we decode and process the data and then enter the pause mode once more. At this point the whole cycle repeats. //  How many readings will we take? //  Somewhere to put the data. //  Which reading are we expecting next? //  Process the interrupt generated by the DHT22. Now we have captured the data we need to decode the timings to obtain the temperature, humidity and the checksum. This method is called from the Timer 2 ISR above. //  Decode the temperature and humidity data. //  If the checksum is OK then overwrite the data. The LOGIC_BOUNDARY definition is simply the number of clock pulses which separates the 0 and the 1. A little empirical research gave this value as 100 clock pulses. This is not exactly as defined in the data sheet but it does give a reasonable working value. The type of data in the packet allows the system to respond to requests for information and also raise alarms. //  Copy the sensor readings into the _txBuffer. //  Notify the GO! main board that there is some data ready for collection. //  Set the alarm thresholds for the temperature and humidity. //  specified limit is not required. //  Start by turning everything off. //  Now work out what we are looking at. //  Tell the Go board which alarms have been enabled (as an acknowledgement). When checking the alarms the application will compare the values for all of the alarms and then raise a single interrupt back to the Netduino GO! if one or more alarms need to be raised. The data packet sent back to the Netduino GO! also contains the current sensor readings. This means that the Netduino GO! does not have to request the sensor data to find out which alarm has been raised. //  an alarm if needed. At this point the majority of the STM8S code is complete. 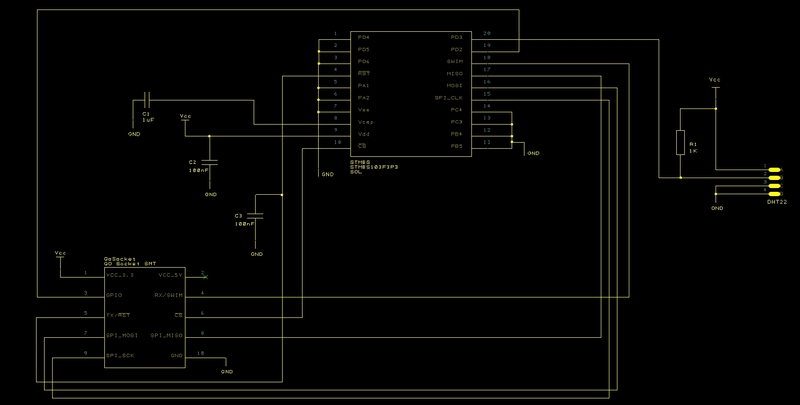 As you can see the module driver is not overly complex as it provides a few methods and supports a single interrupt. /// generated by the STM8S. //  Verify the checksum before extracting the data. //  Checksum good so extract the temperature and humidity data. /// from the module and the resulting value is returned to the caller. /// Set the alarms for the low/high temperature/humidity alarms. /// To turn an alarm off set the value to float.MinValue. /// or above the high threshold. The really interesting work involves the receipt of data from the module. This is triggered by the interrupt being raised on the GPIO pin of the Netduino GO! connector. /// Handle the IRQ events generated by the GO! module. /// exceed the alarm values. The image above shows the DHT22 module connected to the Netduino GO!. A Komodex Labs Seven Segment Display is used to display the temperature and humidity. And here is a video showing the module working. The system shows the temperature for a short while (16.8C) followed by the humidity (46.7%). We were lucky last year as we had a particularly cold winter (lucky for testing). This allowed the module to be test outdoors in a reasonably cold environment. The sensor and the Netduino GO! performed as expected down to -10C when compared to an off the shelf digital thermometer and humidity unit. 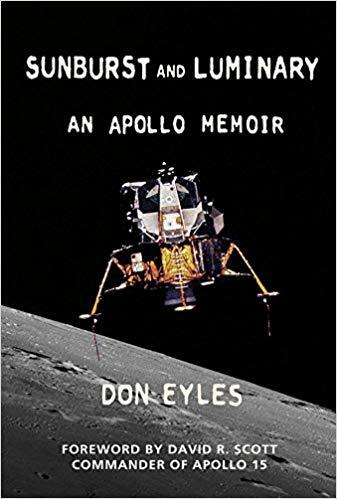 I would have waited for the temperature to drop further by my desire to prove the module has limits and I discovered that standing around outside with a coffee waiting for the module to read lower and lower temperatures had an interest threshold of about 10 minutes. 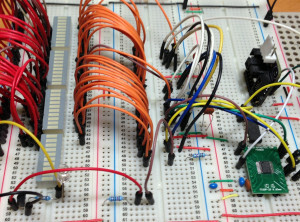 This module shows the power of combining microcontrollers to provide a combined system. The Netduino GO! would have found it difficult to have achieved the work completed by the STM8S. Similarly, the Netduino GO! provides the application developer with the simplicity and power of NETMF, something the STM8S could not achieve. This module has yet to move from prototype into production. Maybe it will someday, just not today. Posted in Electronics, Netduino, Software Development, STM8 | Comments Off on Temperature and Humidity Sensor Module for the Netduino GO!